As I mentioned in a previous post, I have been interested in how the doctrine of theosis has been dealt with in western theology, particularly Protestantism, being a protestant. I suppose it might be wrong to call it a Protestant doctrine of theosis since that is the proper term for the Orthodox understanding, but it works. Well, I’ve also been working on a possible topic for an honors thesis, and have been looking into what I wold term “High Church Evangelicalism,” as this has been the party with which I tend to identify most–that is those churchmen who have been convinced both of the error of Rome and the importance of the Church Catholic properly understood. That being the case I’ve extended my reading beyond the traditional High Church Anglicans and have begun looking toward the Reformed and Lutheran traditions. One interesting figure I’ve run across is a man by the name of John Williamson Nevin who defended the Calvinist doctrine of the Eucharist and was a progenator of what became known as the Mercersburg Theology. 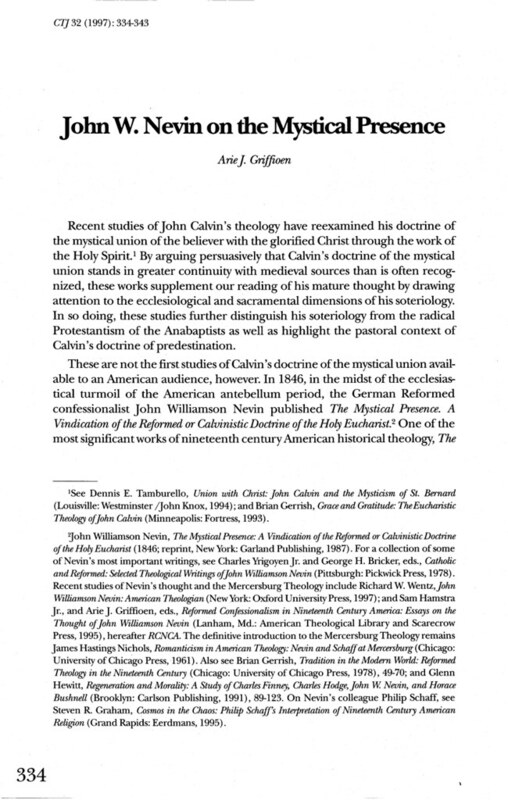 This is the first page of an essay dealing with Nevin and it talks about Calvin’s understanding of unity with God. Very interesting stuff. From the BBC: What kind of legacy. . ..